Debbie and I ... made a trip this morning up past Hardware Ranch and part way to Ant Flats (our usual wildlife prowl). I slept very poorly last night, as expected (see previous post), so I didn't feel safe driving. We wanted to take our Model X because it's such an excellent ride for wildlife viewing, so ... Debbie drove it. This was only her second time behind the wheel of the Model X, and she's still quite intimidated by it. :) She did just fine, except that she flatly refused to back it into the garage upon our return. We saw a lot of wildlife this morning! We got off to a great start when Debbie sighted a fawn, still in spots, just 20' or so from the road's edge (photo at right). Particularly surprising about this fawn was that it was all alone – no mom doe in sight. 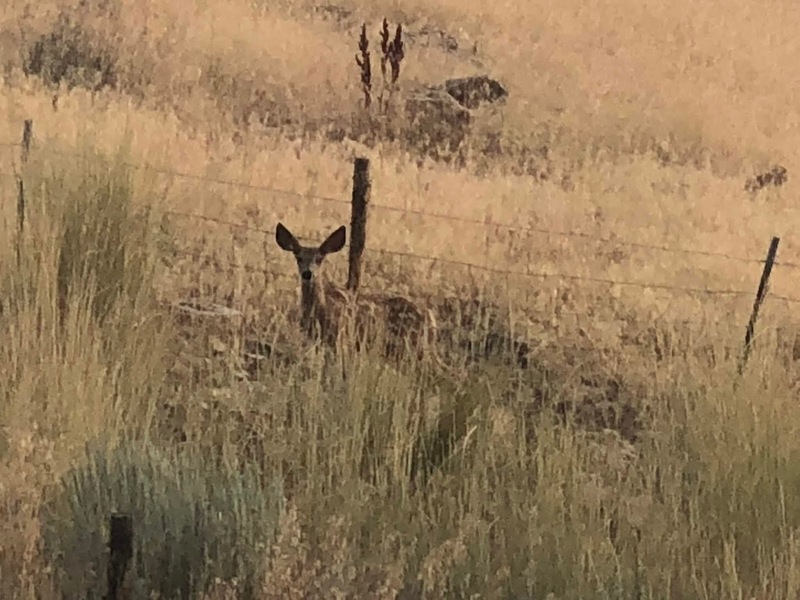 It looked healthy other than having a slight limp, and it appeared to be old enough to graze (if it had to feed itself), so probably the main risks for it are cars and large predators (especially mountain lions, which are reasonably common up here). We're hoping the mom was lurking about somewhere, afraid to come out while we were there. A bit further on we spotted two more fawns, this time with two does (though from their behavior, we think the fawns were actually twins belonging to one of the does). Then on our way back out of Blacksmith Fork Canyon, we had a scare as a fawn crossed in front of an oncoming car, then in front of us – no more than 5' off our bumper. Debbie slammed on the brakes when she first spotted it, and if she had been even a fraction of a second later we'd have hit it for sure. The car beeped and booped, so we know it detected the fawn – but we're not sure if it braked before Debbie stomped the pedal. We saw lots of birds! On the way out toward Ant Flats, we spotted a bald eagle flying toward us at low altitude. It circled three times over a pasture just to the right of our car, so we had some rather nice naked-eye viewing. Later in the trip, as we drove up toward the generating station's holding pond, I spotted a flash of white above a rock maybe 40' higher than us and a couple hundred yards away. I thought it was a small white bird of some kind, but when I got my binoculars on it I discovered that it was the head of another bald eagle, perched behind the rock so that I couldn't see its body. We drove another quarter mile or so down the road and found a parking spot where we had a great view of its whole body. We could see why it was perched there: the thing was soaked! We hypothesize that it had dived into the holding pond to catch a fish (or perhaps steal one from another bird), got wet, and then flew up there to a nice perch for drying.